Something tells me you're looking for children's authors who visit schools. Well, guess what? I’m a children's author who visits schools. You may be looking for an author who does school presentations. That’d be me. A children’s poet? You know it! Or maybe you want a children’s author who conducts writing workshops. Wow—me again! Or someone who does in-service staff professional development. It's like you read my résumé! School author visit guy, keynote speaker for conferences, and spreader of great language arts lesson plans—that's me! 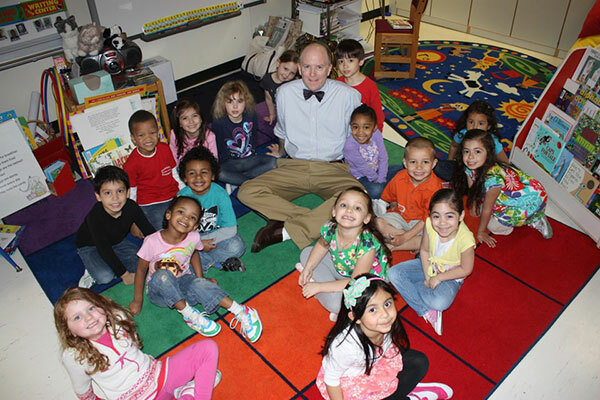 Allow this bow-tie wearing children’s author to give you way more info than you need about school visits and presentations. I have books for all grades K-8 (50+ titles). I have also given teacher in-service presentations, typically about an hour. My school visits typically take some form of the following, but can often be adjusted depending on your school’s needs. Presentations are gatherings in large auditoriums or gymnasiums in which I do nearly all the talking. I’m standing up, the students are sitting down, and I walk students through what I read when I was their age, when I started writing, the importance of influences, and who mine were (Ogden Nash, e.e. cummings, Shel Silverstein, Muhammad Ali, Mad Magazine). These presentations are typically about 45 minutes for older kids, 35 minutes for younger kids. Workshops are smaller, and are only 30 minutes in length, ideally working with fewer than 50 students. I have workshops for every grade except kindergartners (who, of course, attend the large group presentation). Some examples of workshops, going from lower grades to higher grades: making a paper noun quilt, the “verb train” game, the rhyming pairs of nouns contest, anagrams game, the word well, acrostics poetry, personification, and sensory poem writing. In-service workshops for teachers are also available. Here I usually share the lesson plans I’ve had the most luck with, and how I’ve gotten the best writing from students. Books are available through my publisher (Lerner Publishing Group: ask for Customer Service: 1-800-328-4929). They carry hardcovers of all books, and paperbacks of many. All have an author visit discount (44 percent for the hardcover, and 25 for paper). Fees are $950 if your school is within 60 miles of my Cleveland home, otherwise it’s $1,350 per day plus travel expenses. Local (Cleveland area) half-day visits are available for $590, and I’m open to Skype sessions.